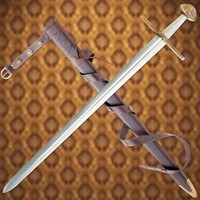 A stunning and historically significant sword. Named after Saint Maurice of the all Christian Theban Legion. St Maurice is seen as the patron saint of the Swiss Guard, armies, soldiers, sword smiths, arms makers and anyone who carried a weapon. 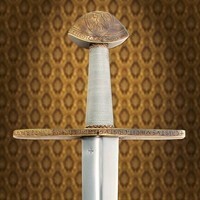 This famous sword is housed in the Weltliche Schatzkammer (Imperial Treasury) in Vienna. Used in the coronation of the Holy Roman Emperors from Otto IV in 1198 to as late as Emperor Karl I 1916. A design commonly used in the 11th Century. The solid brass parts include the proper engravings done by hand that sets it apart from others of the period. Wood grip is wound with silver wire and has brass knot work rings at each end. Has a beautiful leather scabbard and belt set included. Full tang, high carbon steel, tempered 84cm x 4.5cm blade. Note: GST included in price.